If you’re a homeowner, your house needs to be insured for a minimum of 80 percent of its value (not counting the value of the land). You must be proactive and review your current homeowner’s coverage at least annually to make sure that your insurance is sufficient to rebuild or repair your home after a disaster. So, what do you need to look for during the annual review of your homeowner’s policy? The Insuring Your Home and Everything in It worksheet delves into the key components required to make sure that you’re fully and adequately covered. Actual-cash-value coverage: If you have a policy that pays the actual cash value of your home’s contents, you’ll get a check for what your stuff was worth before it was destroyed — not what it would cost to replace it all. Declarations page(s): This annual statement from your insurance company outlines your coverage and your annual premium. Keep it with your policy. Full replacement cost: If your property is destroyed, the insurance company is obligated to fully replace or rebuild your property without any deduction for depreciation. Obtaining full replacement cost on your personal property will cost you only about 10 to 20 percent more than the actual-cash-value coverage. Comprehensive homeowner’s coverage must include full replacement cost to repurchase all the items in your home today if they’re lost, stolen, or destroyed. Guaranteed replacement cost: Even if the damage exceeds the limits on your policy, the insurance company is obligated to fully replace or rebuild your property without any deduction for depreciation. Guaranteed replacement policies aren’t exactly what you might imagine. Insurers limit the amount that they pay out to replace or rebuild your home to usually no more than 20 percent above the amount for which your home is insured. If your home appreciates beyond the level of coverage, the policy won’t cover that amount — even though you thought you had guaranteed replacement coverage. Guaranteed replacement coverage doesn’t end with just the dwelling itself, either; you must also think about the value of the contents of your home. Liability: This type of insurance helps protect you financially if someone is injured by you on your property. Rider: A rider is really a separate insurance policy that goes with your homeowner’s policy to insure special types of personal property. You must obtain a rider on your homeowner’s policy, for an additional cost, to fully insure these items. A copy of your purchase receipt and/or an appraisal may be necessary to substantiate the value of the items covered under each rider. 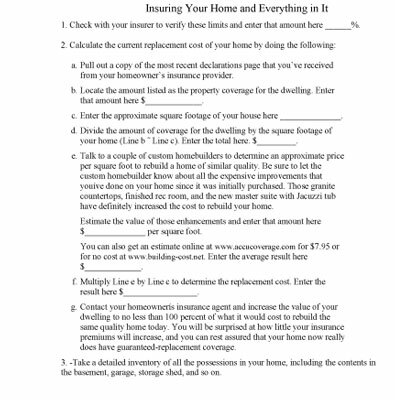 Click here to download and print the Insuring Your Home and Everything in It Worksheet. You live with someone to whom you aren’t married and who isn’t on the deed or title to the home. You may be exposed to water damage due to storm sewer or water backup. You live in a flood zone or are in danger of incurring water damage from other sources, such as hurricanes. The only way to obtain flood insurance is through the National Flood Insurance Program (NFIP), and the coverage isn’t available in some of the most high-risk areas. Contact the NFIP or your homeowner’s agent to find out more. You’re at risk for windstorm damage. Your home is at risk of mold damage. You live in or near an earthquake-prone area.